In the rear neck is the Medalist Sand-Knit manufacturer’s tag size “42”. 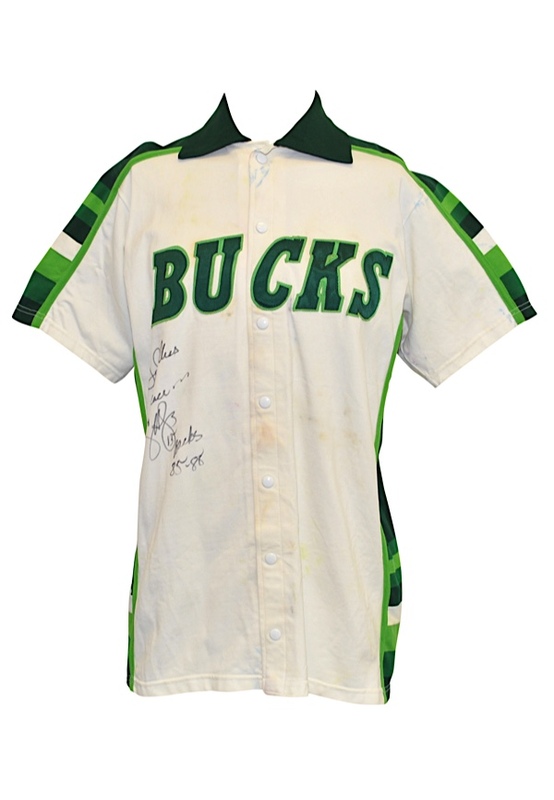 Adjacent to the left is another Medalist Sand-Knit tag that reads “DESIGNED & TAILORED EXCLUSIVELY FOR THE MILWAUKEE BUCKS”. Adjacent to the right is a strip tag that reads “85 42+3” representing the year and the size. Across the chest reads “BUCKS” in forest green on light green tackle twill. There is staining in multiple colors throughout the jacket. Craig Hodges signed the front of the jacket in black marker with the added inscription “God Bless & Peace Bucks 85-88” and in our opinion the signature rates a 8. This jacket is properly tagged and was presented to us as player-worn. Accompanied by a LOA from JSA.